My current works seek to make contact with a subterranean human network of memory outside of time. I am channeling the collective memory which connects all human experience on some level. Referencing feelings that are traces of a historical past, the works reflect my research in pursuit of that revelation. My artistic practice includes painting, photography, printmaking and sculpture. In the paintings I evoke primordial symbols from a world of myth, and transformation, of alchemy and power. The figures represent a feminine god. She is fluid, borderless, representing all eternity. In the divine world of the goddess, she plays a role that is quintessentially female. Her story represents both the totality and also the fragment of the universal that is the personal. A sense of homelessness and exile have been profoundly impactful forces in my life. Naturally, they are woven deeply into the fabric of my artistic practice. I’m a second-generation Cuban-American interdisciplinary artist. I am also queer, though my queerness is less a function of my sexuality than it is a question of exile. Exile from the boundaries of the Normal, the Moral, even the Real. I am brown. I live with physical and learning disabilities. Though vital, none of these things wholly encapsulate me. I am more than the total sum of my categories. But they’re nevertheless significant, even central, to who I am, and subsequently, to my artistic practice. The work I’m engaging in now are visually unconventional works produced through transformative meditative practices driven by the urge to explore my experiences through radical modes of representation that invite viewers to inquire, to experience discomfort themselves, and ultimately to be freed, in whatever measure is possible. Although I do not condone universal and ahistorical narratives of the self, and clearly identify with the various differences that set me and others ‘like me’ apart, as an individual and artist I don’t feel confined to any one group, organizing narrative or aesthetic credo. Instead, I seek to embrace the intricacies and contradictions, the pain and the pleasure, and give it all up, let it exist in the seeing, the listening, and the experience of another. Studied Visual Art at New World School of the Arts where I completed my BFA in Drawing with highest honors in 2017 and was a finalist for the Cintas Fellowship the following year. My work has been exhibited in Cifo Gallery, Unbound, (2017), NoGuchi Breton Gallery, The Incubator (2015), Exile Books, Zines Queens & Everything In-between (2016), Mindy Solomon Gallery, Make It Nice Again (2017), The Night Club, Inside the Writers Studio (2018), The Fountainhead, Everyday is Summer (2018), and the Lowe Art Museum, Cintas Fellowship Ceremony (2018). Rachel Lee’s work examines coping mechanisms from childhood; her visual references pull from ’90s alternative music, video games, and the Miami suburbs. Growing up, Lee spent more time daydreaming through Nintendo franchises and rock albums than living in real time due to being homeschooled. This habit has stayed with her through adulthood. Landscape paintings depict the suburbs, interrupted by polygons and music video-stills. Lee's paintings are a process of accepting the insolation and dissociation she experienced growing up, while manifesting where she wanted to be. Lee lives and works in Miami, FL. Her studio practice focuses on painting, inspired by the DIY work ethic of American punk/alternative rock musicians, the aesthetics of ’90s video game graphics and the memories attached to them. Ana Sofia Batlle considers her very still and intricate work time-based. She thinks about the concept of time in relation to its constant change and very obvious stillness. 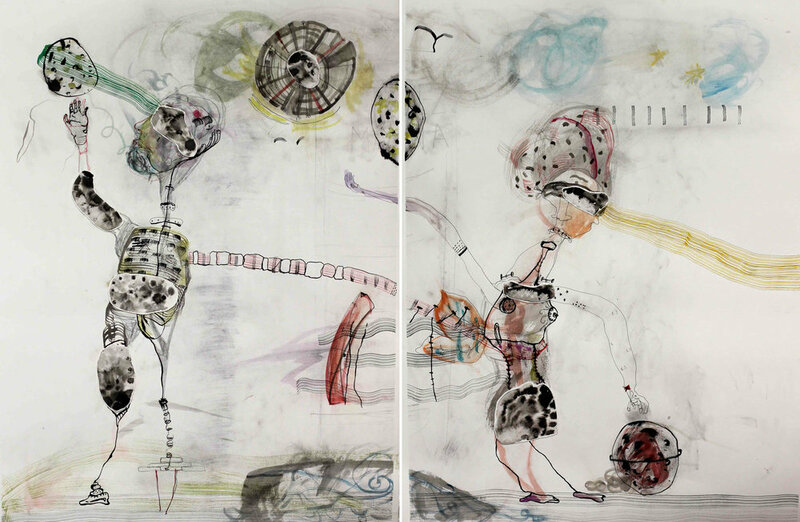 Though time is not a subject explored in her work she sees it as extremely relevant both towards her practice, and the analytical thought behind the subjects she interprets. The Dominican artist graduated with a BFA in Studio from The School of The Art Institute of Chicago in 2018 and moved to Miami, FL to continue her career as a visual artist. Batlle’s drawings and paintings look to depict overlooked subjects and simple ideas through intricate patterns and composition. Her playful, intuitive, and repetitive mark strives at portraying her contradicting feelings of the absence of thought and constant overthinking. My work explores issues of migration and displacement by picking at the history of decorative art and religious iconography in Mexico. Using mixed media and collage, I re-appropriate visual imagery that references maps, symbols, patterns, and language to create embellished images that indulge in and deconstruct colonial art. I often shy away from canvas stretchers and rectangular edges, instead using fabric patchworks and constructions as alternative painting surfaces. These techniques allow me to use painting as a form of installation, where intricate and layered compositions are not just images, but also places in themselves. I often use photographic source material taken from religious iconography, art, and history within my collages. I am interested in how the process of cutting and re-assembling relates to my subject matter. To me, these processes that are fundamental to collage are a way of visually thinking through the dissection, division, and dislocation present in Latinx history and the way that it shapes the conditions we live under today. At the same time, they are also a subversion of that history. Through cutting and reassembling, this iconography is undone and reinterpreted into an eclecticism that resembles the muddled identities we inhabit. From 2009-2014, she acted as Chief Curator at ARTIUM, the Contemporary Museum of the Basque Country, Spain. Afterwards, she has curated exhibitions worldwide: MoCAB, Belgrade; Salzburger Kunstverein (co-curated with Zoran Eric and Seamy Kelly) : EFA Project Space, New York; Centro de las Artes, Monterrey, Museo Carrillo Gil Mexico city; Museo de Arte Contemporáneo de Oaxaca; NC-Arte, Bogotá; RAER, Rome; LAZNIA, Gdansk, Poland, Sala Alcalá 31, Madrid and MUSAC in León, where she also takes part of the advisory board of the museum. Elaborating on an approach closely related to eco-aesthetics I understand art as an instrument of knowledge, through which we can rethink and reformulate other possibilities of commonality and more sustainable strategies to relate to our specific context. Political Ecology, cultural hybridization processes and alternative formats of social organization, as well as iterations of these thematic guidelines, are the vanishing points that my recent curatorial projects have explored in depth, building upon an asymmetrical approach to a liminal territory in which contemporary art is conceived as a device for critical visibilization. Formally, I have been specially focused on Videoart and New Media, as well as Experimental formats that alter and transgress established codes of exhibition making or art writing, exploring non-traditional expanded forms of any type of linguistic I consider pertinent to my curatorial practice. Before 2009, she curated exhibitions internationally in cities such as New York, Prague, London and Madrid. From 2009 to 2014, she acted as Chief Curator at ARTIUM, Basque Museum-Center of Contemporary Art (Vitoria-Gasteiz, Spain) During her tenure, she conceived new exhibition programs as PRAXIS, based in Recycling, process-oriented practices and DIY culture, which featured more than fifteen international artists and also the site-specific project series Grey Flag and Mutatis Mutandis. Between 2014 and 2016, she curated shows at the Museo Nacional de Artes Decorativas in Madrid, Spain; in New York at the Elisabeth Foundation Project Space and at Y Gallery (New York); in Mexico at Centro de las Artes, Monterrey, Museo Carrillo Gil, Mexico City; and Museo de Arte Contemporáneo de Oaxaca; in Colombia at NC-Arte, Bogotá and the group show PIGS in Spain and Porto. She also co-curated the exhibition trilogy Invisible Violence, which showed at MoCAB (Belgrade, Serbia), ARTIUM and Salzburger Kunstverein (Salzburg, Austria). Her critical writings have been included in several international publications among which the catalogues for the Spanish Pavilion at the 56th Venice Biennial and the Greek Pavilion for the 2015 Prague Quadrennial of Performance Design and Space stand out. She has collaborated with periodicals such as (New York, USA) , Arte al Dia International (Miami, USA) and EXIT and Campo de Relámpagos (Spain), among many others. She has participated in several talks, workshops, curatorial residencies and seminars held in a variety of international locations. During this past year she has curated big group shows like Hybris in MUSAC in León, LAZNIA, Gdansk, Poland, Cartografías Líquidas in Museo de Arte Carrillo Gil in Mexico City, Sostener el infinito en la palma de la mano in Sala Alcalá 31, Madrid, among others.